NOTE: I was not the host of the original Strife websites, nor I was directly involved with these in other ways (apart from reading contents or so). The reason I emphasize this is that, admittedly, it can be easy to miss it. Welcome to the "Selected Strife Contents" section! Here you should find a (very) partial backup of contents from the various Strife websites over the times (and a little more): This Strife, That Strife (actually This Strife under a different name and domain) and Strife Strips! Note that quite often, the term "Selected" hides a bit of a different meaning: "Found" or "Rescued". That's because, in general, if I post only some contents out of a specific set (e.g. comics), it means that not everything has been found by me. Furthermore, contents of a blog maintained by Peter Bridger (Maverick) and known as Strife Streams aren't discussed here for now. Well, mostly. See the news post of April 8th, 2012 to figure out why. Thanks shall be sent to Peter Bridger (aka Maverick), Andrew Kepple (aka Sluggy), Paul J. Smith (aka Wally Waffles) and probably more. In addition, thanks should be sent to the Internet Archive project for making this possible. Oh, one more thing: A relevant topic on the Duke4.net forums has been opened. More than two years and a half since the last "Unofficial Strife" was uploaded, a new one is available! 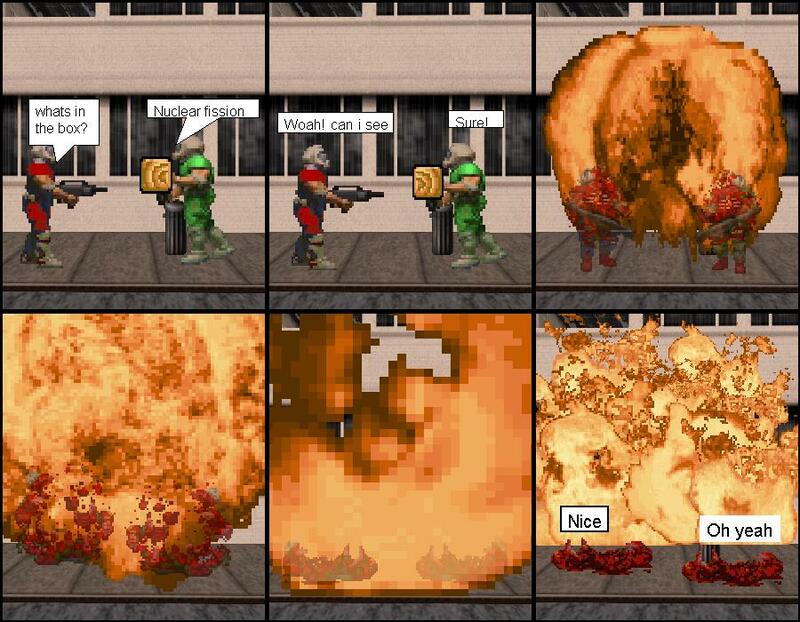 As it's the end of 2014 now, and Keen Dreams source codes have been available since September, Billy Blaze (also known as Commander Keen) can have a little vacation, at least in a comic. Enjoy! Been a bit long since any other post here... I guess a minor status update worths to be mentioned. After not much more than a year since the renewed Strife collection on Tumblr has been put up on the web by Peter Bridger (nicknamed Maverick back in the days), 66 original Strife comics have been automatically (for most) re-uploaded so far. Thanks again to him for bringing these up! I have read these again, and considering what had happened before, I don't want to let them disappear yet again! This is why I store a backup of them here (and also locally). Oh yeah, among these 66 comics, another minor-trilogy has been completed as of yesterday: Attack of the Clones. So, if not yet done then you may want to read something! Guess what? For some reason I've decided to construct a Strife! Well, at least as an unofficial one. For a few more details, and for viewing it... well, you may check it out! Here is a bit different kind of an update I've thought about, mainly because it's not exactly a Strife feature... although TMST (i.e. Sluggy, or Andrew Kepple) had eventually been involved in a way. I've thought of adding a new image gallery. 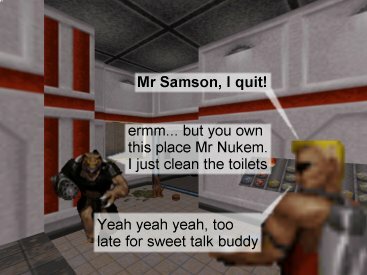 It consists of some older random images I've found from the older Strife websites, now appearing on a single page. Yet again: A very Gothboy christmas. This time, the original page from This Strife is used, with the embedded Flash file obtained from elsewhere. The link to the Flash song later on this page has been updated to point to this page. Yeah, I know... Another Strife is up from Mav: We’re back. As an alternative, you can also check its backup right here. I've just found a Christmas-related Gothboy Flash... song :o. Coming from WCS, its name is: A very Gothboy christmas. I'd add that another old Strife has been automatically uploaded to the new Strife site on Tumblr, and a backup is hosted here as well. Name: JediJediJedi. As an old-new Strife is expected to be up every Monday, I'd probably not keep adding news regarding these (unless there's another reason for an update here, maybe). For future updates, you can follow DukeNukemStrife on Twitter. Alternatively, you can check the new Strife site on every Monday (GMT or GMT+DST times, apparently). Somehow, I've recently spotted yet another Gothboy comic! I refer to 0054-slug-alanrickman, which can now be viewed. 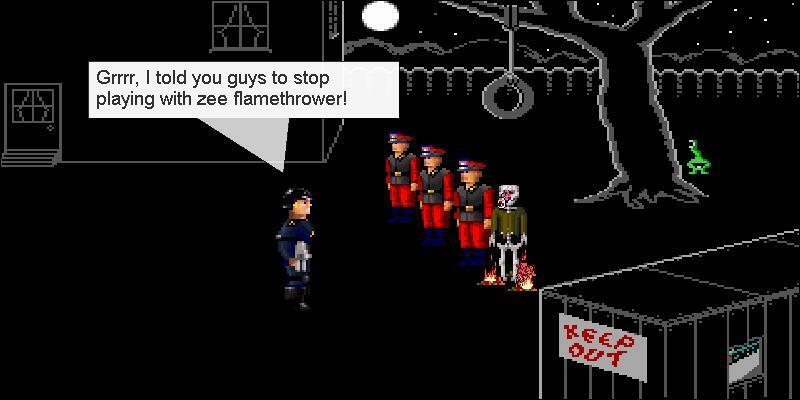 Earlier, I've also gotten a short StripEditor-made comic downloaded, posted on a 3D Realms forum thread. It's up now. Looks like Mav's new Strife page has moved to http://www.thatstrife.com/. Yes, it's the same URL originally used for the older That Strife site! The other URL for the new page still appears to work, but that may change every day. On a related note, as expected from his news post (a strife for every Monday), another old Strife is now up: Hax0r. As with the other three Strifes, I've made a backup copy of it here. Well, I've got some very good news for all readers here! Maverick has located the forum topic on duke4.net used for discussing about this section. As a result, he's started a new page on* http://strifestrips.tumblr.com/, currently hosting the very first 3 Strifes originally uploaded to This Strife. Backup copies should now be available on this section as well. As a future reference, simply look for the link on the top of this page. You can read his relevant post from this day (April 8th, 2012) on Strife Streams. * NOTE: Just a day has passed, and the Strife page has already been relocated to the address of... http://www.thatstrife.com/! It's still powered by Tumblr, though. Oh, and there's one more strife to read for all of you! A few more updates have been applied. Among these, well, lets say I've forgotten to add links to a few more interviews that I've actually prepared... These should now be ready. Thanks to Strife Streams for reminding me there's more than one interview with Ken! As a later Strife Strip has just been added, I've thought of preparing an old Strip Editor page to be readable. I've already had it, just not ready for having it up for viewing in a (mostly) proper form. So, here it is! In case you wonder where is the part "A couple of user submitted comics", well, I've basically combined these with Jinroh's recently uploaded comic. Look for "Later Strife Strips made with the Strip Editor" on this page. Truly, after being a bit unsure, I've realized these two comics were basically of the same "kind" as Jinroh's (i.e. later Strips made with the Editor). Just a minor thing: Looks like some This Strife title picture was missing from Bob Averill's Maps page. Well, the page itself comes from a partial backup of That Strife, while a copy of the image is rather available from the partial This Strife backup! Anyway, it shall be corrected now. Well, I've thought that I may post here whenever some update actually pops up (mainly an addition of something); Especially as we've actually got one! Some stuff shown here actually comes from http://reocities.com/Athens/Thebes/2292/, an old site hosted by Waffles on Geocities. Oh wait, it's a backup of the site hosted on Reocities! Note: All of the Flash movies may be made for specific browser/frame window proportions. Oh, one more thing: If you check out the Strip Editor page, you'd find a couple of original Strips while being edited appearing. Furthermore, if you obtain the Strip Editor source code (yes it's up! ), you can find a little amount of comics, possibly not in their "final" states. There are also a couple of backgrounds from the "Strife world" over there, so at least we can see a few more peaks into it! Strip Editor - A page about an editor used for the later Strife Strips. Warning: A few links to embedded pics might be broken, as they haven't been found. Furthermore, what could be saved (most things) are basically interviews (there's one page currently missing). Warning: Actual text is restored, although some images are missing (most important ones might be on the first page). Yep, there is such a thing! Here is a copy of it for some things not covered beforehand. An actual list of interviews. It lists the same four interviews, along with the "100th Strife" interviews. The first two were produced by Ilsoap and (as of April 29th, 2012) may still be watched on the original Shadowlands sites. The 3rd is an unofficial episode coming from Sluggy. Shadowlands: Episode I - "Leggo My Yego"
Shadowlands: Episode II - "The War Is Afoot"
Shadowlands: Unofficial Episode III - "King Lick, Crazy"
Bob Averill's Maps - A few maps done by Bob Averill; Three are SP, two more MP, and the other two were made for Strifes (sorry, I think none of these are up at the moment). 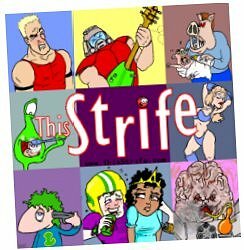 A page with the movie - Originally posted on thatstrife.com, when strifestrips.com was born. This can be considered the latest update originally done on thatstrife.com.